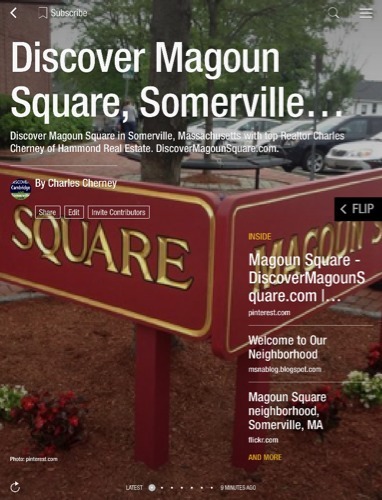 Magoun Square is nestled within a thickly settled residential neighborhood and near Tufts University. Here you'll find a special mix of amenities - enjoy a tall pint of beer at Olde Magoun Saloon, purchase your basic needs at the new CVS, pick up some fresh baked Brazilian goodies at Modelo's Bakery, or even a parrot at Marcelinho Exotic Birds. Beautiful 5 rm, 2 bed, Bright & Sunny top floor unit has been nicely renovated yet still maintains it's Victorian charm; moldings,hardwood Flooring, bay window & 9 ft ceilings w/medallion. Lots of natural light! Lg EIK w/42" cabinets, stainless appliances & recessed lights. Updated boiler, replacement windows & newer roof. The unit has an exclusive use balcony, office & additional exclusive 400 sq ft basement area. Renovated bath w/recessed lights & linen close, in-unit laundry area. 5 minute walk to the NEW MAGOUN SQUARE T STOP! Also, 5 minute walk to bike path, and 20 minute walk to Davis Square. Pet friendly.